The EEZTire Tire Pressure Monitoring System by EEZ RV Products is a wireless tire monitoring system that monitors your vehicles tire pressure and temperature. We have found this little device to be priceless. It’s ease of use along with the peace of mind it gives you makes the price more than worth it. When we first got the EEZTire Tire Pressure Monitoring System from Amazon, the manual looked complicated and the install seemed more than a bit daunting. However, I quickly found a great YouTube video (link below) that demonstrated the installation and showed how easy it was. You can set your own high/low pressure warnings and high temperature level. Our monitor sits on the dash of our class A coach and has no problem communicating with the tire probes on the coach and the car we tow behind. Oh, did I mention that you can add up to 22 tire probes to the single dash base unit. That means you can add your toad to the monitor so you’ll know if you blow a tire on your car while towing. That’s a very great feature. After the installation, you’ll love the large LCD screen with easy to see graphics. Our monitor came fully charged, but you may want to plug in its 12v cord into your vehicles 12v accessory plug to make sure it gets fully charged. It does use rechargeable batteries so you only use the 12v cord while charging. In real world use, which for us means about 10 hours a month, we easily get about 3 months of use before I recharge the battery. Even then, the little battery icon only shows about 1/2 discharge. With the EEZTire Tire Pressure Monitoring System you have two choices of tire probes. 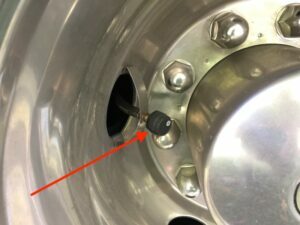 The ones we got are the ones that are anti-theft requiring a special tool (don’t lose it) to get the probe off so that you can add air to your tire. This is great if you believe that the probes would actually be stolen. In hindsight, I wish I had purchased the air pass through probes that will let you inflate your tires without removing the probes. You can always change your mind and purchase the other type of probe, but then you’ll have extra probes that you don’t need. 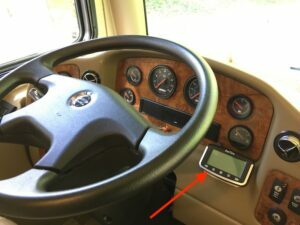 Overall, we love the EEZTire Tire Pressure Monitoring System and would recommend it to all RVers. It gives you great peace of mind and has every feature that we need. You may consider if you really need the anti-theft probes and, if not, I would recommend the air pass through probes.